Mr. Patrick Carton, surgeon at Whitfield Orthopaedic and Sports Clinic, became an Honorary Research Associate of Waterford Institute of Technology (WIT) earlier in the month and has recently begun a research collaboration with staff in the Department of Health, Sport and Exercise Science, to assess functional changes following arthroscopic hip surgery. The research, part-funded by an IOTI postgraduate scholarship, will track changes in athletes’ functional performance capabilities at three months and one year post-surgery. Arthroscopic hip surgery is a growing interest area within the sports medicine community internationally. It has also received particular attention In Ireland as the number of surgeries carried out on young sports people has risen markedly in the last few years. This rise is linked to a greater awareness of relationships between chronic groin issues and the hip joint, as well as greater awareness of conditions such as femoroacetabular impingement, which is a bony abnormality of the ball-and-socket joint at the hip. Dr. Michael Hanlon, lecturer and researcher in Biomechanics in the Department of Health, Sport & Exercise Science at WIT, commented that “the current research collaboration between WIT and Whitfield Clinic will make a substantial novel contribution in the area of femoroacetabular impingement by providing objective data on the functional outcomes, for example power, speed, agility, flexibility etc., following surgery”. For further information about the research project, please contact Dr. Michael Hanlon at [email protected] or 051 302166. 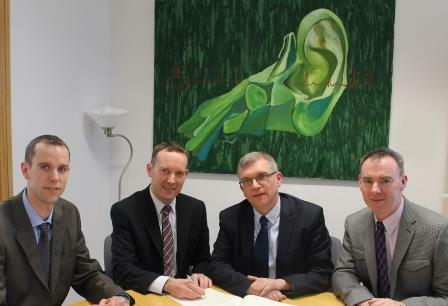 Mr Patrick Carton, surgeon at Whitfield Orthopaedic and Sports Clinic, signing the Honourary Research Associate contract at Waterford Institute of Technology. Pictured from left to right are Dr Michael Hanlon, WIT; Mr Patrick Carton, Whitfield Orthopaedic and Sports Clinic; Prof John Wells and Dr Michael Harrison from WIT.